Well, since I was tracking temperatures in Montana yesterday, I figured I'd update a few today. I'm just including the METAR sites this time as there were not outstanding intermediate readings. Note, these are not official climatological lows for any specific period. They simply are the lowest reported reading or reported minimum within the last 24 hours ending today at 22Z. The -33ºF in Havre was the lowest observation that I could find. That is cold! Not to be out done, Denver experienced some cold this morning as well. I was coming back from a graduation party at * ahem *, four this morning and I noticed that it seemed "Butte-cold" out. What do I mean by "Butte-cold"? Well, growing up in Butte, Montana, during similar arctic air masses, the cold air would often sink into the valleys of southwestern Montana creating extremely cold pockets of air. I've seen as low as -48ºF and been outside at -46ºF (imagine me sitting in my living room in back in the late 90's, preparing to go out and deliver newspapers when turning on the Weather Channel and seeing THAT on the local forecast). It felt similar in Denver this morning as the cold air hugged the lower areas in the Front Range. It was cool to see all the refineries in Commerce City and their billowing steam plumes coming to an abrupt stop at the top of the inversion. One refinery had a nice flame on the top which was flickering and illuminating the "cloud deck" almost making it look like there were explosions occurring. It was very odd. Speaking of inversions, check out the sounding from this morning! Wow, that's cold for Denver! The low at the airport of -19º smashes the record by 15ºF!! This is Typhoon 27W Dolphin. Figured that might warm you all up just a bit. 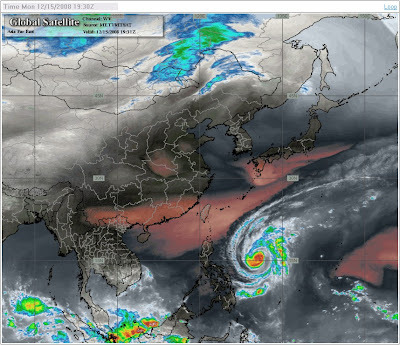 Satellite image used with permission; courtesy of IPS Meteostar Inc.